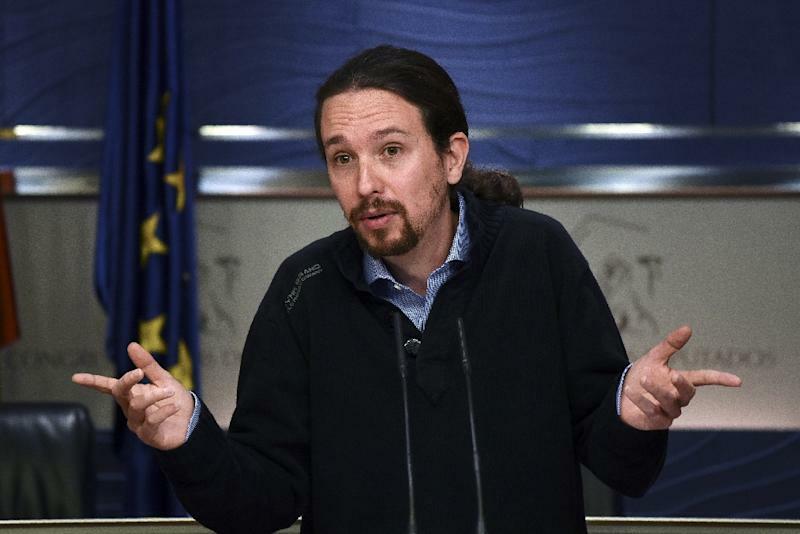 Madrid (AFP) - Spain's anti-austerity party Podemos on Wednesday dealt a blow to the country's Socialists -- racing to try and form a coalition government following inconclusive elections -- when they suspended negotiations with them. Podemos made the announcement after the Socialists secured the backing of centrist party Ciudadanos, which Inigo Errejon of the far-left grouping said "prevents the possibility of forming a pluralistic government of change". The support of Podemos is vital to Socialist leader Pedro Sanchez as he seeks enough backing from lawmakers to become prime minister when they vote for or against his programme for government next week. This was now "doomed to failure" by the agreement with a party Podemos considers too liberal, Errejon said, sparking a furious response from the Socialists. "Podemos is lying and knows it," said Socialist parliamentary spokesman Antonio Hernando. It "has demonstrated that it doesn't really have the will to gather our forces together to form a government for change." Spain has been mired in political deadlock since December elections resulted in a hung parliament split among four main parties, none of which has enough seats to govern alone. The ruling conservative Popular Party (PP) won the most seats but fell short of an absolute majority. The party's leader, acting prime minister Mariano Rajoy, gave up attempts to form a government after he failed to get support from other parties fed up with austerity and the corruption scandals plaguing his grouping. King Felipe VI then asked runner-up Sanchez, whose Socialists won 89 seats out of 350, to form a government but he too has struggled to create an alliance -- until now. 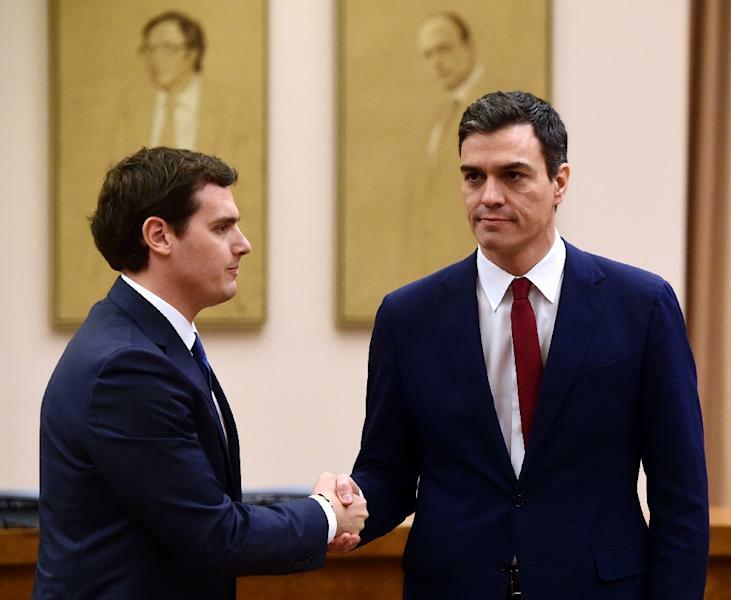 "It wasn't easy for the Socialist party and Ciudadanos -- which have different projects -- to be able to put what unites them... above what separates them," Ciudadanos chief Albert Rivera told reporters. Sanchez and Rivera shook hands to applause earlier Wednesday after signing the agreement, which centres on what a new government led by the Socialists would look like. But even with Ciudadanos's support, Sanchez is well short of the tally needed, which means Spain still has no government in sight nearly 10 weeks after the elections. Podemos, with the 65 seats it won in the elections, could have been a valuable partner. But the long-established Socialists were wary of joining forces with an upstart party born just two years ago out of anger over austerity, and which ultimately seeks to supplant it. And crucially, Podemos had always refused to enter an alliance that would also include Ciudadanos, pushing instead for a left-wing coalition with its leader Pablo Iglesias as deputy prime minister. He needs an absolute majority -- 176 ballots -- in the first vote of confidence due to take place on March 2. That is almost certain to fail, leading to another vote 48 hours later, in which he would only require a simple majority -- another tall order. As Spain emerges from a severe economic crisis, many say fresh elections would be a disaster for the country, particularly as opinion polls suggest the outcome would by and large be the same as that held in December. On Tuesday, Spanish business leaders warned that going to the polls again would be an "incomprehensible failure."